BlytheLife.com » Your best dolly mail day? Your best dolly mail day? On Monday, I happened to receive two pieces of Blythe-related mail. One was a box that was potentially large enough to fit a Blythe that I was rather concerned that I had maybe bought one and forgot about it (does this happen to anyone? It’s never happened to me before, but there is a first for everything…) and the other was a bright pink envelope (which made me really happy, just because it was pink). This was the most doll-related mail I’d gotten in one day before, two pieces of mail. Although I do think that my best dolly mail day was the day that Margaret Meets Ladybug (Bennett) arrived. The problem with that mail day is that I wasn’t home and instead there was the card telling me that I could go to the post office the next afternoon to free her pick her up from the post office. But as I’m not one to constantly buy Blythe related items (or participate in multiple, overlapping swaps), I don’t get a lot of mail (usually) beyond bills and other boring ‘To the Occupant’ stuff. The most dolly mail I’ve ever gotten in one day! 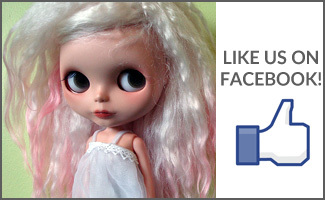 So I just have to ask… What’s the most doll mail you’ve ever gotten in one day? What was your best dolly mail day ever? What arrived in the mail? 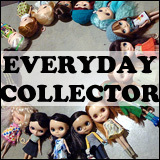 And if you’re looking for a Flickr group dedicated to just dolly mail, check out Dolly Mail Days. 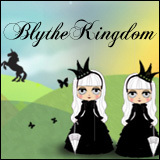 What can beat receiving your very FIRST Blythe? 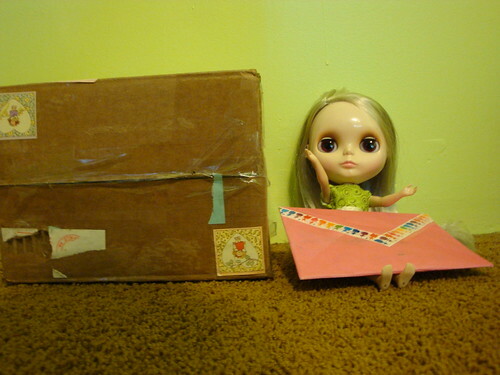 I believe that was my very best Blythe mail the day I received RubyNell! The SECOND best day? When RubyNell arrives back from the spa this week!!! OH, MY! RubyNell has arrived from the spa…and I was right! The second “unboxing” was such a fantastic mail day! I was stalking the mailman this week and was so excited to see her again…. Today was totally up there, even though it was just one box. But it contained my scalpless FruPu who will eventually be getting a reroot, and a partially rerooted dream of a Susie, with the mohair to finish it. I think the best mail day was for sure the day Pez (My first blythe) arrived! I’ve had some pretty crazy mail days though for sure, with a huge package from a spree in Gina’s shop, when all the etsy shopping arrives in the same day. Isn’t getting dolly mail the best? I’m always a little bummed when the mailbox is empty! My best dolly mail day? When My PCM arrived. This was pretty much the holy grail Blythe for me.